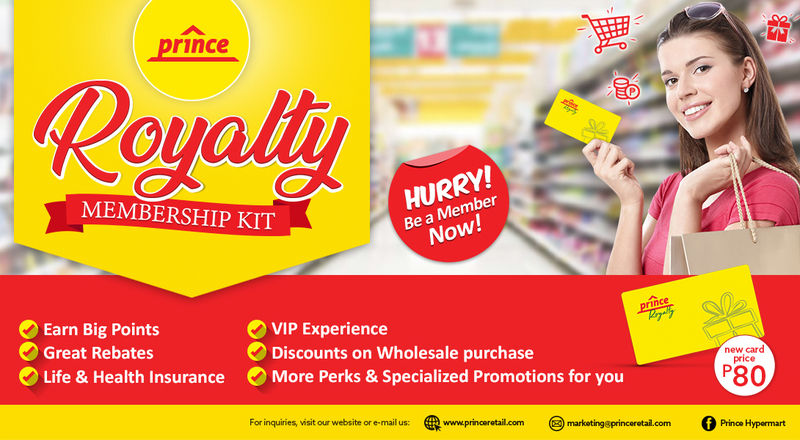 All Royalty members/cardholders can avail the Royalty deals at the Prince Royalty Corner! No points shall be earned for Royalty Deals. Go to the Customer Service booth at any Prince Hypermart and fill up the application form. Pay ₱80 for the permanent card, to be released instantly after payment. Present ROYALTY CARD to the cashier for every sales transaction, and begin earning points. *The Royalty Card and its points expires every 2 years but membership to the program is on a lifetime membership. Card Renewal fee will be announced later on. You can redeem points anytime as long as you use the Royalty card. 1. Double your points on your birthday! 2. Special award items and privileges for members. 3. Priority for bundling and special promo packs. 4. Invitation to ROYALTY Gathering and ROYALTY Annual Convention. 5. Chance to be qualified for a Grocery Loan. 6. Discounts on Wholesale purchase. 7. No more temporary card but an instant Royalty card to be released right after sign up and payment. 8. Your personal information is safe with us. 9. Easy card replacement with an instant Royalty card upon payment. 10. Renewal fee (to be announced) can be paid through your Royalty points. Card and points expire every 2 years but membership is lifetime. View and redeem your points anytime at our customer service booth,no more waiting! As long as you bring your Prince ROYALTY Card all the time, you can enjoy your shopping at Prince. To qualify for Royalty Gold, achieve the minimum accumulated qualifying purchase worth ₱300,000.00 to ₱999,999.99 PER YEAR. Avail of Royalty Deals Automatically. A customer can only avail 10 sets per variety per day. No points shall be earned for Royalty Deals purchases. See Royalty on how to earn points. To qualify for the Royalty Platinum, achieve the minimum accumulated qualifying purchase worth ₱1,000,000.00 and up PER YEAR. A customer can only avail 20 sets per variety per day. City proper within 5 kilometers from the store. * Customers in islands delivery up to port only. * Customers in mountain barangays delivery up to the nearest terminal/waiting shed.